There was a bit of an upset at the 2009 Academy Awards when it came to the Foreign Language Film category. Though most critics predicted that the Israeli film Waltz With Bashir or the French drama The Class would walk away with the top prize, the award instead went to a small Japanese film many people hadn’t seen. As I haven’t seen any of its competitors, I can’t say whether or not Departures indeed deserved to win. However, I can say that it’s a good film, despite a formulaic plot and a score that frequently distracts from the film rather than enhancing it. 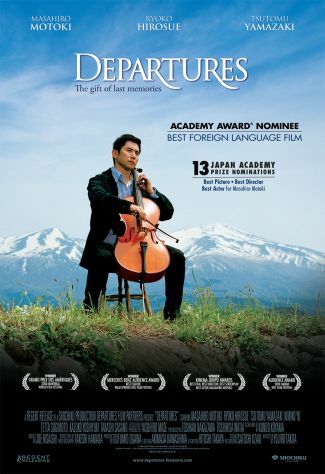 Departures follows Daigo (Masahiro Motoki), a cellist who moves back to his old hometown after his orchestra is dissolved. Desperate for a job, he spies a classified ad for “assisting departures” and decides to apply, thinking it’s most likely for some sort of travel agency. It’s actually a listing for a funeral home and involves the ceremonial cleaning and preparation of bodies in front of mourners before they can be placed in a coffin. Given the taboo nature of death in Japanese society, it isn’t exactly a dream job, but he decides to give it a try at the behest of the director, Mr. Sasaki (played to perfection by Tsutomu Yamazaki). The primary flaw of Departures is its predictability. It’s a typical fish-out-of-water story, complete with the obligatory comedic moments as Daigo gets used to his new occupation, the initial discrimination from friends and family, and their ultimate acceptance of his new profession. There’s even a subplot tacked on involving the father who abandoned him, as if screenwriter Kundo Kayama realized that the plot was very by-the-numbers and needed an emotional payoff. There is nothing here we haven’t already seen in other films, with one notable exception: the emphasis on embalming and the rituals of death. It’s this key theme that lifts Departures above other formulaic (and some might argue emotionally manipulative) tales about loss and makes it worth seeing. Mr. Sasaki performs the ceremony in complete silence, treating the body with grace and dignity. It’s almost like a ballet as his fingers stretch, pull, turn and mold each cadaver until it has achieved some small measure of beauty. This is a spiritual time, an instant in which death and life intermingle and it’s not uncommon for a mourning relative to momentarily forget that their loved one is, in fact, no longer alive. It’s during quiet moments like this that the film truly shines. There are a few scenes that consist primarily of Daigo playing slow and melancholic melodies or portions of symphonies on his cello. The music briefly carries him, his audience, and us to a higher plane of being, that special place in our souls that only the best of art can fill. It makes sense that he’d come to work with the dead; like music and art, this is a ritual through which he can briefly touch the sublime. Unfortunately, other tender and emotional scenes like this are frequently hijacked by an overbearing melodramatic score. Director Yojiro Takita fails to realize that when dealing with delicate subject matter like death and art, sometimes less is more. Thankfully, despite a few mistakes, he usually gets things right. I saw this film shortly after the death of a loved one. At the time, I was disenchanted with the idea of funerals and ceremonies - why spend so much time and money dressing up the dead? It certainly does them no good. Departures is aware of this contradiction. There are several scenes in which, after a ceremony, Daigo and Mr. Sasaki share a huge meal of beef or chicken, tearing into the flesh of animals with renewed vigor. Without death, the rest of the earth could not receive nourishment and live. This is why the final “departure” is so important. Not for them, but for us, as a sign of respect for the life they lived and the lives that will continue on after their passing.